By Tracy Severson, R.D., L.D. Editor’s note: This is the first in a short series of posts on resolutions. We selected resolutions to feature based on comments left by our Facebook fans in December. ‘Tis the season for making New Year’s resolutions—are you one of the millions of Americans resolving to lose weight or eat better in 2013? Generic resolutions without a game plan are much more likely to fall by the wayside before the Superbowl (hot wings, anyone?). This year, resolve to set clear, achievable goals to improve your diet and health in 2013. Need help getting started? Here are the top three nutrition-related improvements I would love to see more people adopt in the coming year. Eating within an hour of waking helps kick start your metabolism for the day. Continuing to eat a light snack or meal every three to four waking hours will keep your blood sugar levels stable and prevent you from getting too hungry (which can lead to overeating high-fat, high-sugar foods later in the day). Calories in liquid form—including soda, coffee drinks, juices (yes, even 100 percent fruit juices), energy drinks and sports drinks—aren’t filling, so you don’t eat any less to compensate for them. Instead of sweet drinks, try plain water, herbal tea, or zero-calorie flavored waters to quench your thirst. For a quick meal, make a fruit smoothie with fresh or frozen fruit blended with skim milk & plain yogurt. 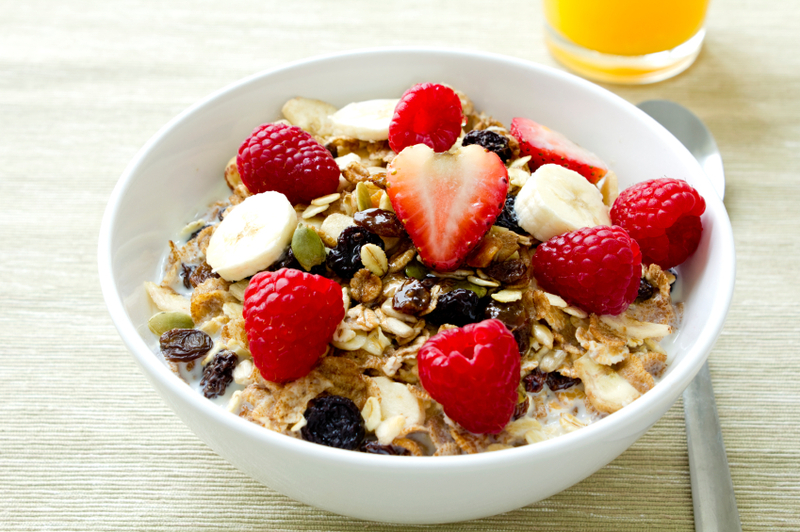 You get all of the fiber from the fruit, so it will fill you up! Feeling gung-ho about your new healthy diet and tempted to load up on fresh produce, but afraid it will all go bad before you can use it? Spend a little time at the beginning of the week planning your meals and snacks. Use the meal plan to make a grocery list and stick to it. This way you’ll have all of the needed ingredients but not too much fresh produce or other impulse buys. Now you’re set for healthy meals and snacks all week long! Here’s to a healthy and happy 2013! Tracy Severson is an outpatient clinical dietitian at OHSU. She earned Bachelor’s degrees in Nutritional Sciences and Sociology from the University of Arizona and completed her training to become a Registered Dietitian (R.D.) at the University Medical Center in Tucson, Arizona. Since becoming an R.D., she has also completed a Certificate of Training in Adult Weight Management. Tracy moved to Portland from Tucson in 2010, and has worked at OHSU since 2011. She works with the OHSU Surgical Weight Reduction clinic and Cardiac Rehab program, and also provides medical nutrition therapy for General Adult Outpatient Clinics at OHSU. Brycie Jones is OHSU's social media manager. You connect with her via email at socialmedia@ohsu.edu, or on Twitter: www.twitter.com/bryciejones.